" This table was adapted with permission from B. Alberts, D. Bray, J. Lewis, M. Raff, K. Roberts, and J. D. Watson (1983). "Molecular Biology of the Cell." Garland Publishing Co., New York. FIGURE 1-15 Model of human erythrocyte membrane. Speculative model based on the human erythrocyte major glycoprotein oligo-meric complex. Phosphatidylserine and phosphatidylglycerol (solid circles) are distributed asymmetrically. Abbreviations: GP, glyco-phorin; III, component 3; IVa, component 4.1; IVb, component 4.2; V, component 5 or actin; VI, component 6 or GP-3-D; VII, component 7; Sp, spectrin. Reproduced from Nicholson, G. L. (1982). In "Biological Regulation and Development" (R. F. Goldberger and K. R. Yama-moto, eds. ), Vol. 3A, p. 222. Plenum, New York. mone is normally (in the absence of an endocrine disease related to hormone secretion) strictly related to the organism's perceived "need" for the biological response^) generated by the hormone in question. The "need" for any hormone will be determined by the physiological set point for that endocrine system. 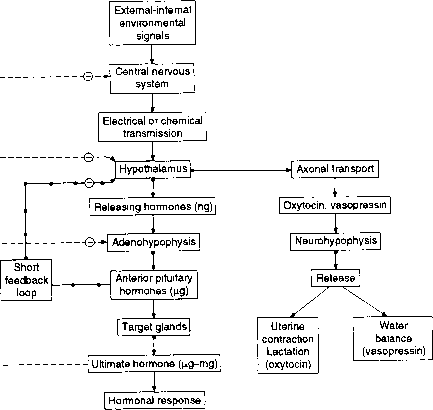 Thus, a characteristic feature of most endocrine systems is the existence of a feedback loop that limits or regulates the secretion of the hormonal messenger. There are two general categories of endocrine feedback systems: those involving the CNS and the hypothalamus and those where the function achieved by the hormone (elevated blood glucose, elevated serum Ca2+, etc.) directly feeds back upon the endocrine gland that secretes the hormones. Figure 1-12 depicts a schematic diagram of a peripheral feedback system analogous to that utilized by PTH and l,25(OH)2D3 to maintain a normal serum Ca2+ level in the range 9.5-10.5 mg/100 ml of serum. When serum Ca2+ falls, PTH secretion is stimulated and the secreted PTH initiates, at distal target organs, a biological response^) that elevates serum Ca2+. In the event that the serum Ca2+ rises above 10.5 mg/100 ml of serum, there is a feedback signal to the parathyroid gland that represses the secretion of PTH (see Chapter 9 for additional details). 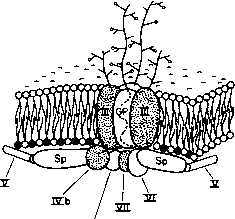 FIGURE 1-16 Model of a fluid mosaic membrane showing distribution and mobility of cell membrane receptors. (A) Integral transmembrane glycoproteins occur in a domain of the membrane of different lipid composition; a glycosaminoglycan molecule is shown associated with the carbohydrate side chains of the glycoproteins. 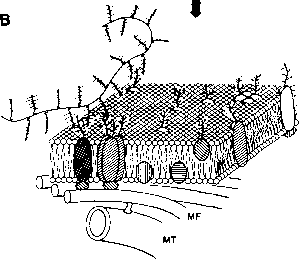 (B) Aggregation of some of the glycoproteins stimulates the attachment of cytoskeletal components: microfilaments (MF) and microtubules (MT) to peripheral membrane components on the cytoplasmic surface are shown. Other unattached integral membrane proteins are capable of lateral motion. Reproduced from Nicholson, G. L. (1982). In "Biological Regulation and Development" (R. F. Goldberger and K. R. Yamamoto, eds. ), Vol. 3A, p. 225. Plenum, New York. FIGURE 1-17. Schematic model of a chromosome. 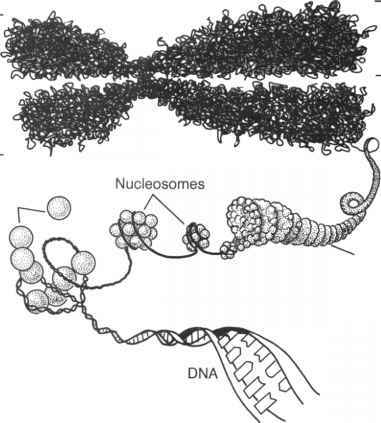 The DNA double helix is wrapped around a core of histone proteins to form a nucleosome; altogether the DNA of a single human chromosome is estimated to have approximately 1 million nucleosomes. The nucleosomes, in turn, aggregate to create a very ordered structure termed the "chromatin fiber." The resulting chromatin fibers, which are approximately 30 nm in diameter, condense to create clustered, looped regions that create the chromosome. Each chromosome is composed of two chromatids. This figure was adapted from Becker, W. M., and Deamer, D. W. (1991). 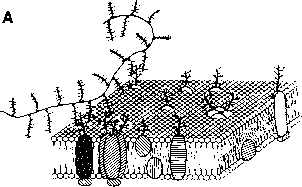 "The World of the Cell," 2nd edition. The Benjamin / Cummings Publishing Co., Menlo Park, CA. adenohypophysis (see the legend to Figure 1-13 for additional detail). this may contribute to the aggressive properties of a tumor. This is particularly so if the oncogene product is an analog of a cellular growth factor that stimulates growth of the tumor. These complex details are considered further in Chapter 20.